Why Can’t Grant Morrison Stay In Continuity? I love Grant Morrison. You love Grant Morrison. 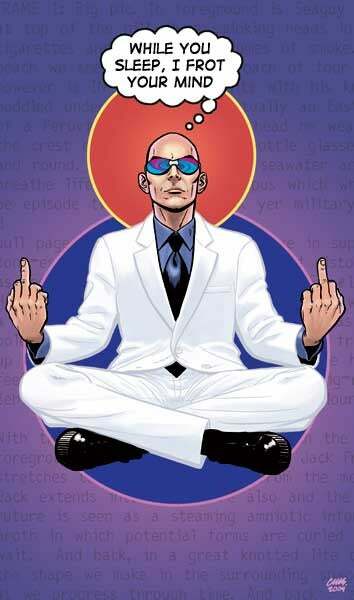 Your significant other is probably thinking lewd thoughts about Grant Morrison right now. But there's one place where G.M. gets no love: mainstream superhero comic continuity. What's up with that? For the last decade or so, anything Grant Morrison has written in the mainstream Marvel or DC universes has been almost immediately repudiated or swept under the carpet. This isn't an unusual phenomenon in comic books – creators regularly see their story arcs and characters sloughed off a title once they relinquish creative control. You leave a comic and Ultron mows down all your new characters with a wheat thresher. It happens all the time. No, here's what's unique about Grant Morrison. Here's this critically acclaimed creator whose books sell fairly well who's consistently given free creative license over whatever character he damn well pleases. And when he wraps up a run on a comic – more often that not – the status quo boomerangs back to whatever it was before Morrison got on board. It's perplexing. Can you imagine this happening in any other medium? CHRIS NOLAN: I don't want to direct Batman 3. STUDIO: That's okay. We'll bring in another director. Also, Rachel Dawes isn't dead, Harvey Dent's just in a coma, and Arnold Schwarzenegger's Mr. Freeze is the villain again. Also, the movie is coming out next week. 4.) The New Gods died. 5.) The Monitors wished themselves out of existence. 6.) The Zoo Crew came back. How many of these paradigm shifts are still in effect? Batman's coming back in the Return of Bruce Wayne, and Martian Manhunter's already strutting around, flaunting his not-deadedness. As for the rest of the changes, Darkseid and the New Gods had already died months earlier in Countdown to Final Crisis, so that was nothing new. The Monitors didn't make a lick of sense after Infinite Crisis, so it was easier to pretend they didn't exist in the first place. So yeah, I guess the Zoo Crew was the biggest thing to come out Final Crisis, which is sort of insane when you think about it. The Grant Morrison Turn-Around Effect isn't limited to Final Crisis. Let's take a look at some other titles in which Morrison's big, gee-whiz changes flip-flopped in a fortnight's time. New X-Men: Magneto infiltrates the X-Men under the guise of the peace-loving Uighur mutant Xorn. Wolverine lops Magneto's head off. Once Morrison left the title, it was immediately retconned that Wolverine didn't kill Magneto, but rather the real Xorn who was posing as Magneto. Xorneto also had a twin brother (who was also named Xorn), who was exactly like Xorneto, but was not a bad guy. Confused? So was everyone ever. Batman: In Batman R.I.P., Batman "died" in a helicopter crash. A few issues later, he was alive again, puttering around in Final Crisis, where he would fake die...again. Now, I'm not sure if the end of Batman R.I.P. was Morrison's original design or due to editorial tinkering, but it's pretty strange storytelling to kill your hero dramatically one month, droop the narrative sails by immediately resurrecting him, and then kill him dramatically again in a half a year's time. Of course, I'm working with the assumption that these changes were by editorial mandate - what if Morrison actually wants his narrative geegaws put back in the toybox? This exchange between Morrison and Animal Man from his late 1980s run on Animal Man is fairly telling. As you see here, Morrison as the author has put Animal Man through the wringer. He resets Animal Man's life to its prior condition, before he as the comic scribe started screwing around with Buddy Baker's existence. This scene echoes the end of New X-Men, in which Jean Grey frees Scott of his guilt by telepathically encouraging him to get together with Emma Frost. This scene is reminiscent in turn of the end of Final Crisis - the Monitors and their multiversal meddling are wished out of existence by Superman, who wishes for a happy ending. So the real issue may not be some grand Anti-Grant Morrison conspiracy, but rather that Morrison understands the nature of the medium. Morrison will have his fun with Batman and Wolverine, but at the end of day, he'll have to put them back on the shelf - the characters are merely his to rent. He's likely weirdly okay with putting his grand, earth-shattering imprimatur on characters and then letting the next writer reverse everything he just did. It may not be so much that Grant Morrison is constantly at loggerheads with continuity - in fact, he's probably come to terms with it. No matter what cosmic insanity Morrison subjects Bruce Wayne to, at the end, he just really wants Batman to dig this day. Many thanks to my brother Clayton for the inspiration.